Join us for MSA’s annual climbing workshop. This year’s workshop will showcase all the tools a climber can utilize to safely and efficiently move about a tree. 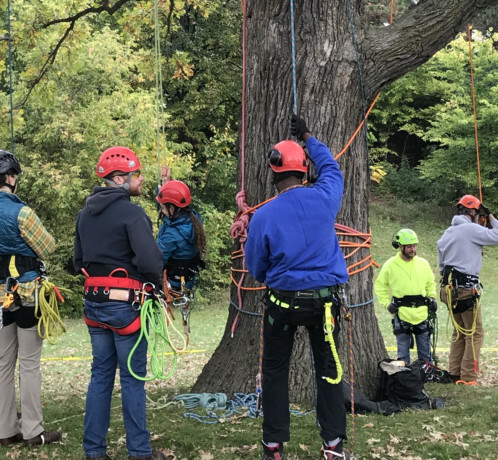 Participants will be divided up into groups and spend time with an instructor learning about different tree climbing tools in short 45 minute modules. The workshop is open to 30 participants of all ability levels. Participants are encouraged to bring their own equipment but it’s not required this year. All must meet ANSI standards and will be inspected by MSA instructors and techs during registration. You can checkout with a credit card or choose to receive an invoice to pay by cash or check. No refunds will be issued after September 7.